Red Rake Gaming invites all its customers, friends and visitors of ICE London along to its stand N9-325 to gain an insight in to Red Rake Gaming and its next groundbreaking releases planned for 2019. As first time exhibitors, Red Rake Gaming looks to further cement its position as a premium provider of gaming solutions to the regulated market around the globe. In less than three years of delivering real money casino games to the industry, Red Rake Gaming has built a reputation of delivering top quality content thanks to the innovative and forward thinking Red Rake Gaming development team reinforced by the most well known Global operators being part of the Red Rake Gaming family. Red Rake Gaming will be showcasing 5 different casino genre’s offered to their partners: slots, video bingos, video pokers, blackjack and roulette, making Red Rake Gaming a one stop shop for casino operations. Red Rake Gaming’s games keep growing in popularity thanks to the top notch graphical quality and the features and bonus rich gaming experience that they offer to players. All games are developed in HTML5 and optimised to offer a great playing experience on all type of devices, specifically mobiles and tablets. The company, with offices located in Spain and Malta, holds a UKGC licence and has a MGA licence application in place, and has its products certified for several regulated markets like Spain, Portugal, Italy and Romania. “ICE London is the biggest gaming event of the calendar and it couldn’t come at a more exciting time for us. We have just secured a licence to provide our games in one of the biggest regulated markets in the world, the UK, so the show will be a great opportunity to greet our current partners and to help us to grow of footprint in the industry”. 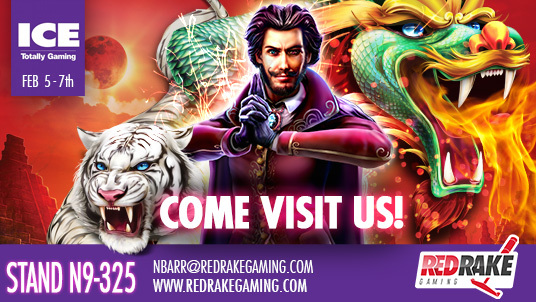 Visit Red Rake Gaming team in Stand N9-325 at ICE Totally Gaming, which will be held at ExCeL London, from 5th of February to 7th of February of 2019.